It looks like a new player is in town. 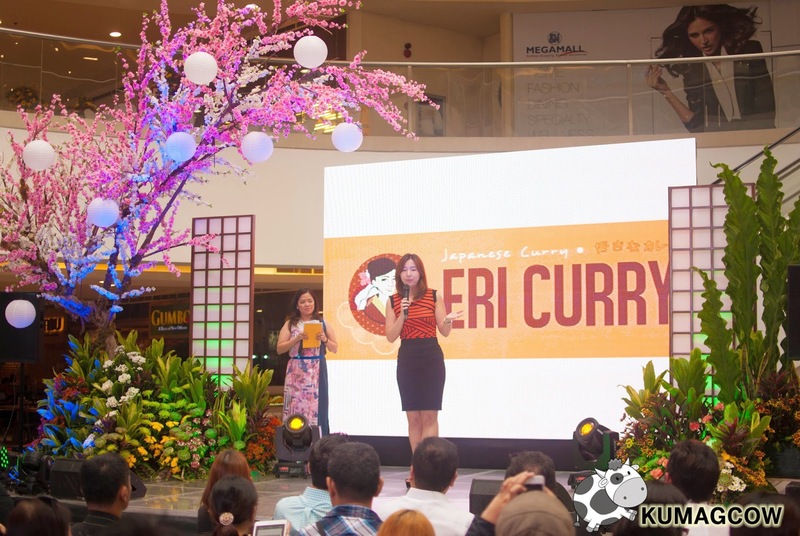 Eri Curry, a local brand set to ignite your taste buds with their own version of Japanese curry at the atrium of SM Megamall's building B. The owners have been journeying Japan and other countries, seeing great potential on a staple food item in Japanese specialty restaurants and thought Filipinos would absolutely love this! They did it with a pretty festive and grand way that afternoon when Geishas performed modern dance numbers inspired by Japanese themes. I loved what they did on stage because it felt like Cherry Blossoms season once again. One of the owners is Concert Queen Pops Fernandez, the Chef and other executives opened and blessed the store a few days ago. Then we went inside the quaint store to get a taste of their specials. This is Sakana Warm and Tender. It's Sole Fish wrapped in rice and slightly spicy Japanese mayo. It's a little heavy because it's deep fried with Tempura batter if I'm not mistaken. I would have wanted this to be a regular maki instead. This is their Ebi Futo. It's Shrimp Maki with Romaine Lettuce, Cucumber, a dab of Japanese Mayo and light soy dressing. It's sweet, I like this a lot because it's refreshing and it's like you're eating salad on a Maki roll. It's better than the Sakana Warm and Tender. This is their FIERY Katsu Curry. It's Pork Tonkatsu sitting on a bed of premium Japanese rice and a flooding of Curry Sauce with streaks of soft egg. They have three levels of spiciness on the curry but I find it still moderately spicy on the Fiery level. It's a 5/10 but you can use the chili powder available on the table to make it even more spicy. The dish is also pretty heavy, one that can probably feed two women. Men can have it on their own. In Japan, they usually have this after a night of drinking. If they are woozy, they want something ultra flavorful and make them sweat a bit so this is perfect. The price point is a little high at 320, but you get the premium ingredients for your food so I don't think you are getting shortchanged. It's time for you to experience it at the third floor of SM Megamall's atrium. Come with your friends and family, the place can probably seat up to 50-70 people as some seating is also available outside the store. Make this your next curry destination since it's a really good place to try it.